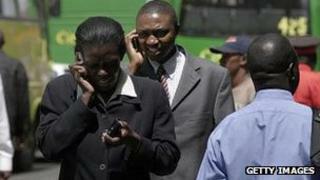 Kenya has confirmed that a switch-off of counterfeit mobile phones will take place at the end of the month. In addition, networks will be forbidden from activating new "fake" devices bought after 1 October. Government officials said the move was designed to protect consumers from hazardous materials and to safeguard mobile payment systems. They added it should also help them track users and limit violence ahead of March's general election. The action had originally been scheduled to take place at the end of 2011, but was twice delayed to give subscribers a chance to replace their devices. However, the Ministry of Information and Communications has said this would not happen again. The government said three million users were using counterfeit handsets as of June. Official data suggests the country had 29 million mobile phone subscribers at the end of March. The Communications Commission of Kenya (CCK) defines fake handsets as "copies of popular brands and models made from sub-standard materials" that have not been licensed by the organisation. They are sourced from China and other parts of Asia, as well as Nigeria and South Africa. The CCK said "sub-standard components" were often used which had not been put through safety checks and might emit higher than recommended radiation levels. They have proved popular since they are often sold at a heavy discounts to legitimate models, thanks in part to the fact that retailers avoid paying import taxes. But the commission said they had caused an increase of dropped calls for all users because of "their inability to connect seamlessly to the mobile networks". Law enforcement agencies had also complained that some of the devices used duplicated IMEI (International Mobile Equipment Identifier) codes, making it difficult to track down users suspected of using their handsets to plan crimes. In addition, when the government publicised the switch-off in June it also linked the move to efforts to restrict fraud. "In this era of mobile banking, use of counterfeit devices, which are manufactured without due consideration to the recognised security standards, may expose our mobile money systems as well as the wider banking and financial system to unnecessary risks," said the communications secretary Dr Bitange Ndemo. "The government cannot allow this to happen and thus our decision to have all unregistered SIM cards and counterfeit handset mobile phones phased out by 30 September 2012." The move was initially opposed by the Consumers Federation of Kenya, a campaign group which said the action would punish users who were not to blame for the fact fakes were sold. But last month the organisation dropped a theat to go to court to block the switch-off after a study suggested most Kenyans supported the effort. Sunday's deadline also means counterfeit models can be barred from networks ahead of the election on 4 March 2013. About 1,300 people were killed and hundreds of thousands forced from their homes because of clashes following 2007's disputed presidential election. There is concern the vote could spark further violence, and the CCK has suggested that ensuring all mobiles were registered could act as a deterrent. "As the general elections draw near, we... have an obligation to ensure that the mobile telecoms industry is not used to perpetrate instability and to incite violence," said Francis Wangusi, the commission's director general. Users can send a free SMS message containing their 15-number IMEI code to check that their handset is recognised as genuine. The fact millions of devices will need to be replaced presents phone manufacturers with an opportunity to boost sales. But there are also been worries that abandoned handsets could end up in landfill sites, damaging the environment. To minimise the risk Nokia and Samsung have partnered with a local recycling company and mobile service providers to allow users to safely dispose of counterfeit models at collection points in major cities. "Mobile phones contain many valuable and useful materials that can be recycled, including precious metals and plastics," said Bruce Howe, general manager for Nokia East Africa. "For every one million phones recycled, it is possible to recover nearly 35kg of gold and 350kg of silver, which can be re-used in the production of future electronic goods." The firm added that it believed Kenya's move was a model that could be adopted elsewhere in Africa and beyond. Uganda has already said that it planned similar action.